If you are looking for an eerie story to give you chills, this is the one for you! It’s a perfect pick to read at this time of year. I actually had never heard of this book until it was featured as a Group Read for the RIPXII challenge. I always enjoy doing this seasonal challenge every year and love to participate in the Group Read, so I borrowed the CDs from my library and was fascinated by this spooky tale right from the get-go! I have a thing for haunted houses, and this one was right up my alley. However, this one was so much more than that. 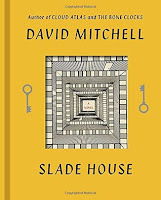 Yes, the story does revolve around Slade House and the inhabitants that are tied to it (being a pair of twins, Nora and Jonah) but the most fascinating bit is the nine-year cycle. The entrance to Slade House is through a black iron door in an Alley, but it can only be found on the last Saturday in October every nine years. The twins lure one (un)lucky visitor each cycle and that person is never seen again. 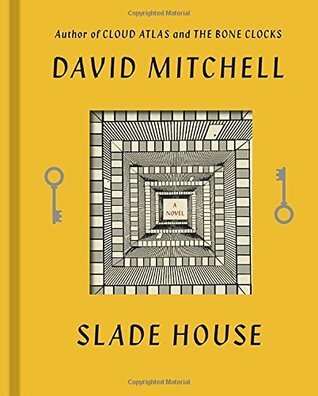 I loved how Mitchell moved us through different cycles and learning how the different victims met their fate, and the author manages to weave the different cycles together seamlessly. My favourite character is Fred Pink! This author is new to me, and I can’t wait to read more of his work! Unbeknownst to me, this is actually the sequel to The Bone Clocks but it also works as a standalone. I plan to read the earlier book as well. 4 stars!! It was really good, and you should put it on your TBR list if you enjoy horror or creepy tales! The sample said this is the sequel to book one..gads now I want to listen to both!! I listened to the audiobook, too. I thought it was excellent, and I really enjoyed both narrators, but I kept wishing I could flip back to earlier sections of the story, so I wish I had gotten the print edition out from the library as well.